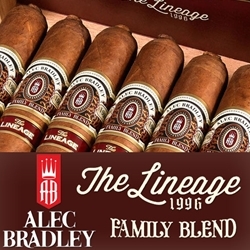 Released in 2014, The Lineage is an extension of the popular Alec Bradley Family Blend line of hand-rolled premium cigars. Produced at the Raíces Cubanas factory in Honduras, each cigar is individually crafted by skilled cigar rollers who use medium-bodied blends of select Honduran-Nicaraguan tobaccos for the fillers and binders, finished off with an oily, dark brown wrapper from the lush Trojes region of Honduras. What makes the Alec Bradley Family Blend The Lineage so popular amongst premium cigars uses, is the superb smoking experience each of these gems produces. Hints of dark cocoa and leather along with woody and cedar components, adding a special dash of spice, makes a perfect recipe for a perfect cigar! The Alec Bradley Family Blend The Lineage are hand-rolled premium cigars that make an excellent choice for any cigar connoisseur. Smokers Discounts has made it easy and affordable to buy premium cigars online. A variety of sizes and flavors are listed below at our discount online cigar store. Each of these styles are in stock and available. Call us for more details!